reproduction: 9 to 18 month gestation (varies with temperature and availability of food) yields an average of 12 live-born "scorplings". did you know? 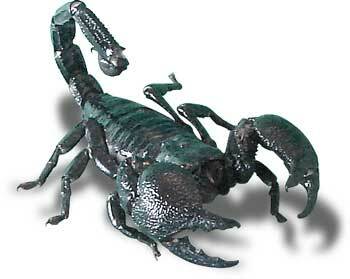 Despite it’s fearsome appearance the Emperor Scorpion’s sting is no more venomous than a honeybee’s. 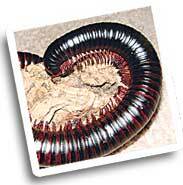 The African Millipede is a much more approachable arthropod than the emperor scorpion. While the Jungle Lady displays both at her shows, audiences prefer to hold the millipede and report that it "tickles".